Betty is ready to climb. I didn’t write a journal entry for this day, so everything I write here is from memory, which is still very vivid. We’ll see if we can get the important stuff down. I was awakened sometime in the middle of the night by a flashlight beam raking across my tent. 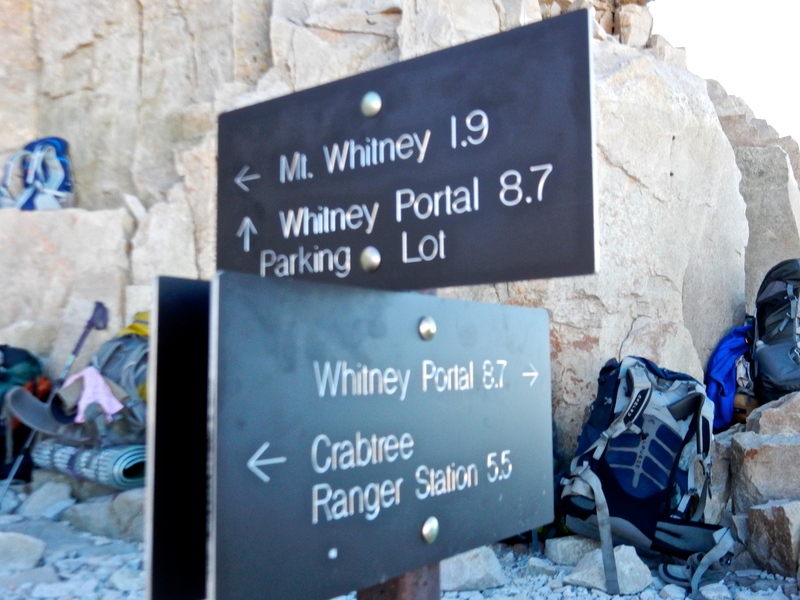 Apparently, many hikers start the ascent up Whitney in time to see sunrise from the summit. That means leaving Guitar Lake by about 3:00 AM. Betty and I opted not to do that. But looking out my tent, it’s a pretty neat sight, seeing small points of light spread out all along the switchbacks ahead of us. They look like stars that lost their way and fell to the ground, moving very, very slowly up the mountain. Seeing all this activity made it difficult to go back to sleep, but I managed for a couple more hours. Then I woke up Betty and we started getting ready for the ascent. First, breakfast. I had my absolute worst meal of the trip, quite by accident. Betty had brought some sort of broccoli cheese thing (just add hot water), which I thought might be good. I had tried this at home pre-trip, and it was pretty tasty. So I decided that I would add a little oatmeal to it to give it more body. Unfortunately, I didn’t notice that the oatmeal was one of those horrible, way-too-sweet mixes. the combination of the salty cheese/broccoli and the sweet oatmeal was ghastly! But I ate most of it anyway, because I needed to eat something and there it was. Yuck! Never again! 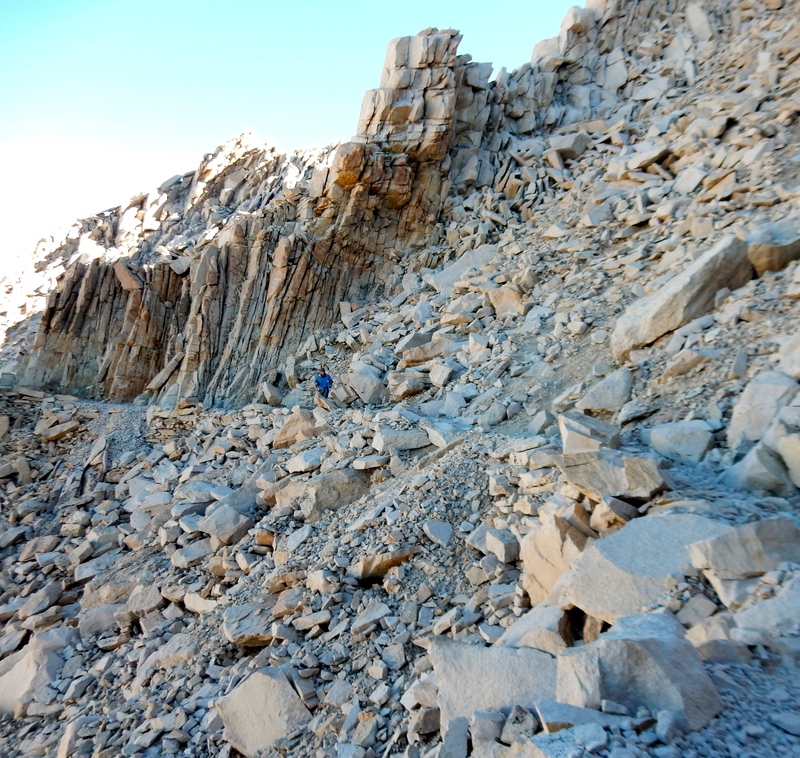 We set off by about 6:30 AM, I think, and immediately began to climb seemingly endless switchbacks up the side of Whitney. Up, up, up we went, first one direction and then the opposite. The whole mountain seems to be made up of giant broken squared-off boulders, piled up to the horizon far above us. 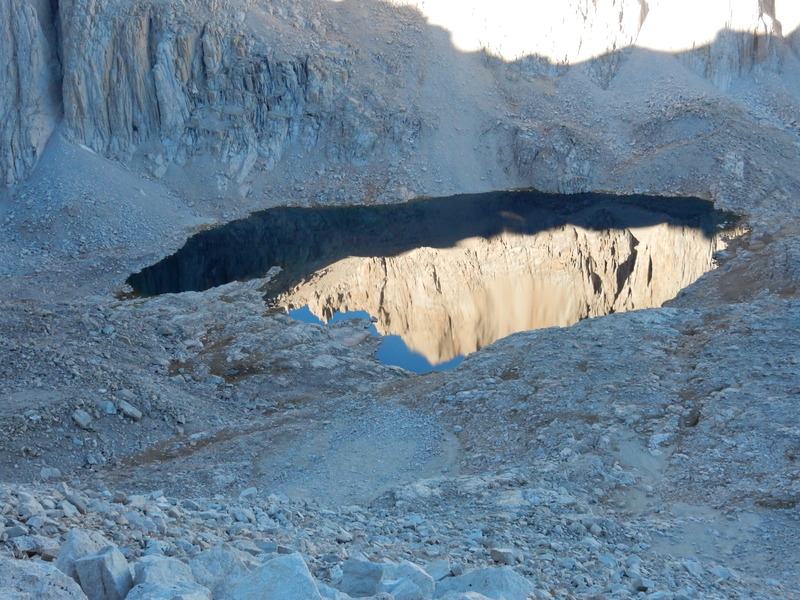 As the sunlight grew stronger, the tarns below us changed colors from deep steely blue-grey to coppery gold. All the way up the miles of switchbacks, I marveled at the trail-building skills of the people who made it possible for us to hike as easily as we did. It seems like a nearly-super-human effort of blasting and grading and moving rocks. 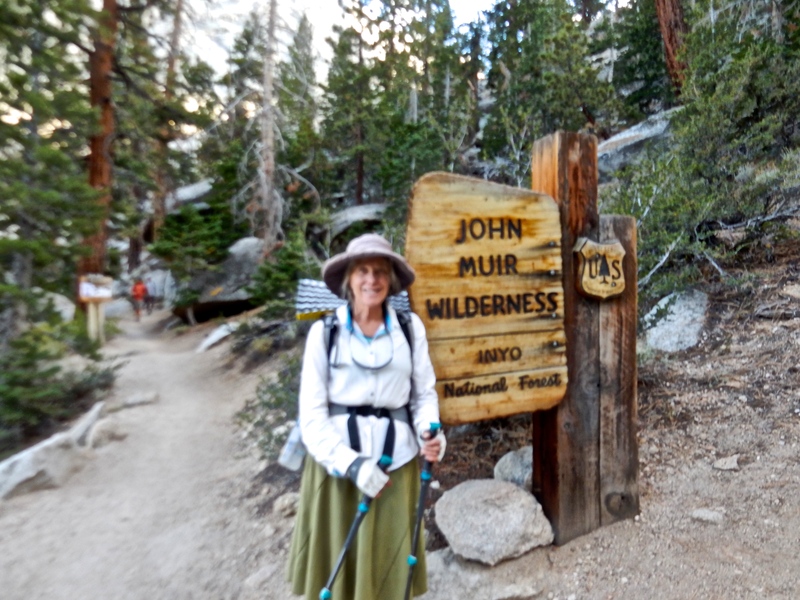 We are on a section of the JMT that isn’t open to stock animals, unlike most of the rest of the 200+ miles. John Muir himself disliked bringing stock into the mountains, as he saw firsthand how they degraded and changed the ecosystem so dramatically in the mid-1800’s. Thankfully, these high mountains are no longer open to herds of sheep and cattle to feed in the summertime. But without mules to bear supplies of food and equipment, these trails might never have been built for us to enjoy. It’s complicated…I found myself thinking often how Muir would probably have disliked, if not outright hated, the trail named after him. 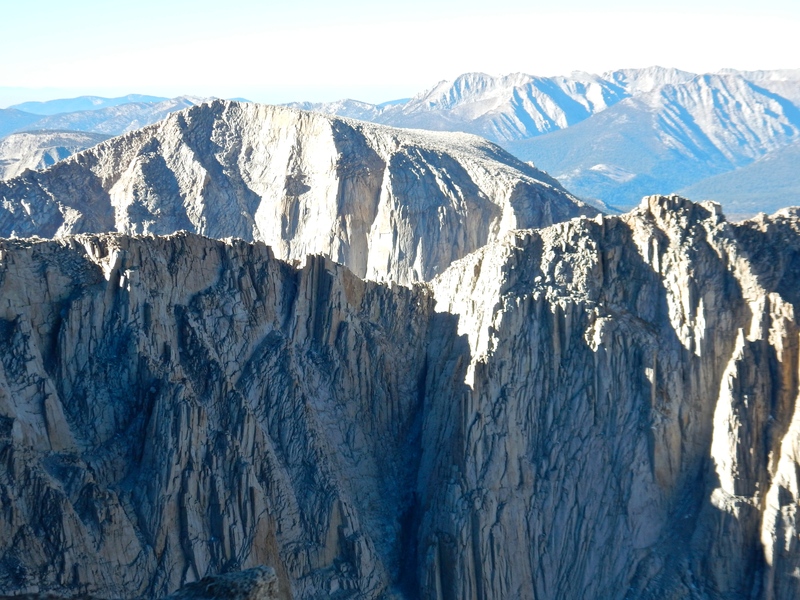 Finally, the switchbacks ended, at the trail junction with the summit trail and the trail that headed down some 5,000’ and 8.7 miles to the parking lot at Whitney Portal, and the store/restaurant’s ice cream and french fries. People are talking about what they are going to have to eat first. A parking lot! How novel! 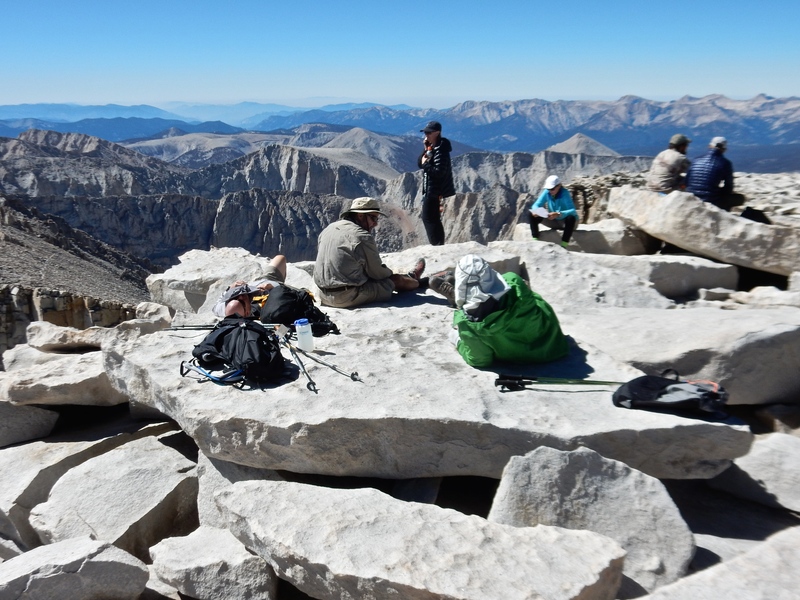 At the trail junction, everyone drops their packs to make the hike to the top relatively unencumbered. When we arrived, there were probably 20 packs lined up, and it was interesting to see all the different models and hiking styles represented there. mostly very nice technically-advanced stuff, like titanium bear canisters. Betty and I rested for a bit and organized our makeshift daypacks in anticipation of the summit. My “pack” was a small zippered container tied around my waist with Tom’s Roy Rogers bandanna. Such a useful item! From the trail junction, the summit path gets very rocky, and we sometimes had to use our hands to climb over or around them. The downhill side of the trail drops off precipitously, with views of Guitar Lake, looking like a teeny-tiny ukulele below us, and spires of broken rock rising above us. 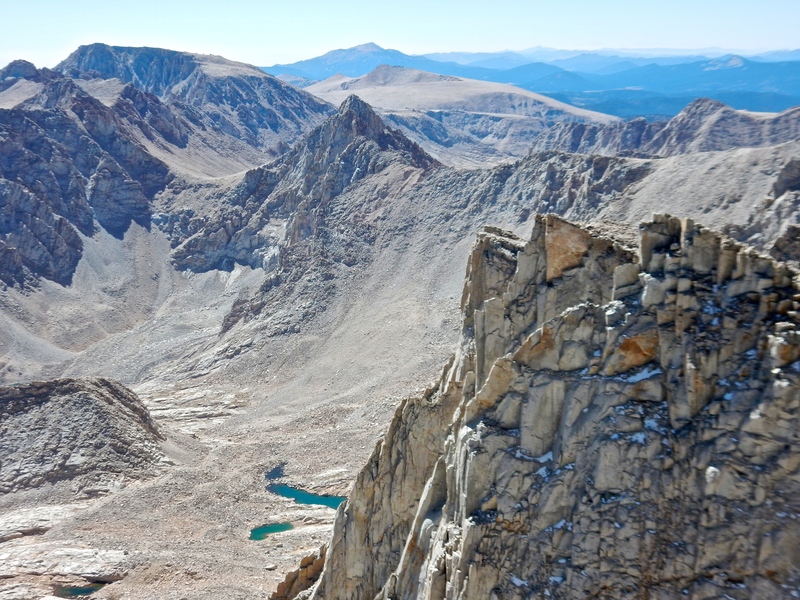 We crept along the edge, fighting off vertiginous feelings, up and up the long (1.9 mile) spur trail to the top of Whitney. 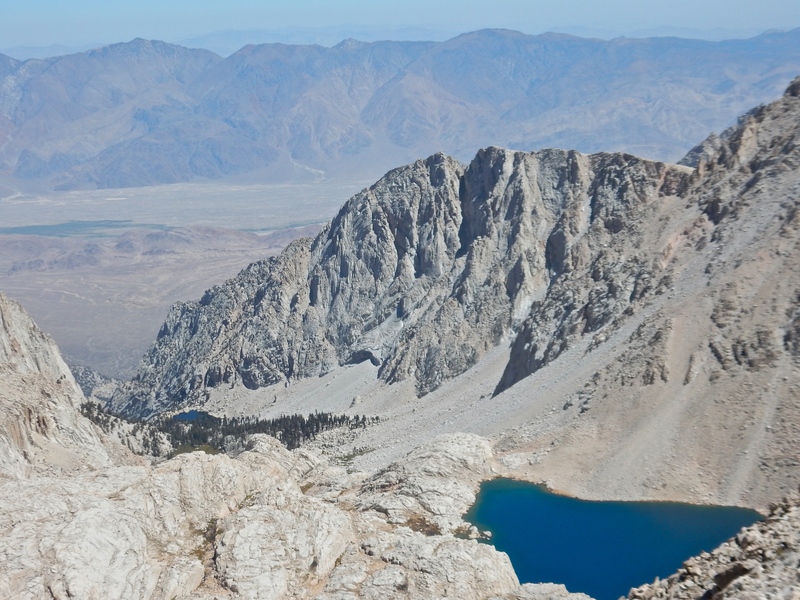 Every once in awhile, the trail comes to a saddle between the east and west sides of the ridge, and a window opens up to the Owens Valley, 7,000’ below us. Breathtaking! 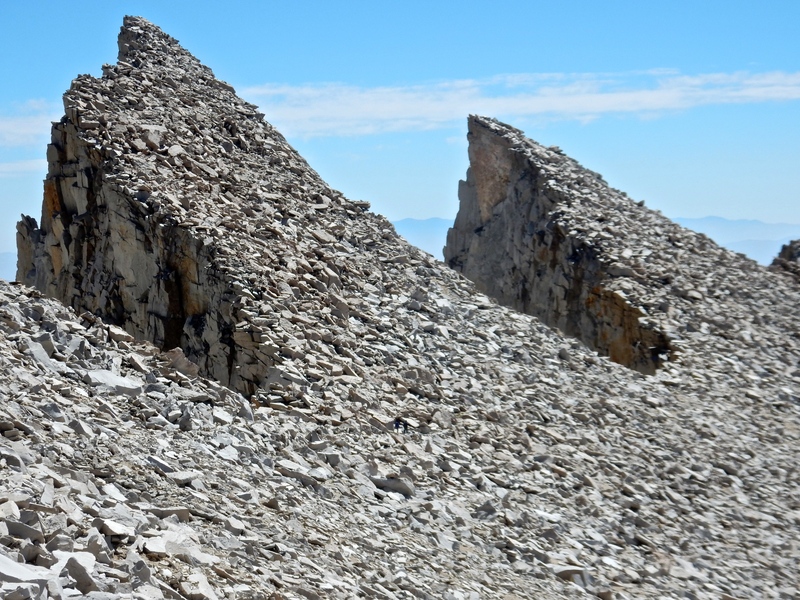 Finally, the trail turned west and wended its way over the broken granite slabs that make up the surface of the highest point in the Lower 48, at 14,505’. 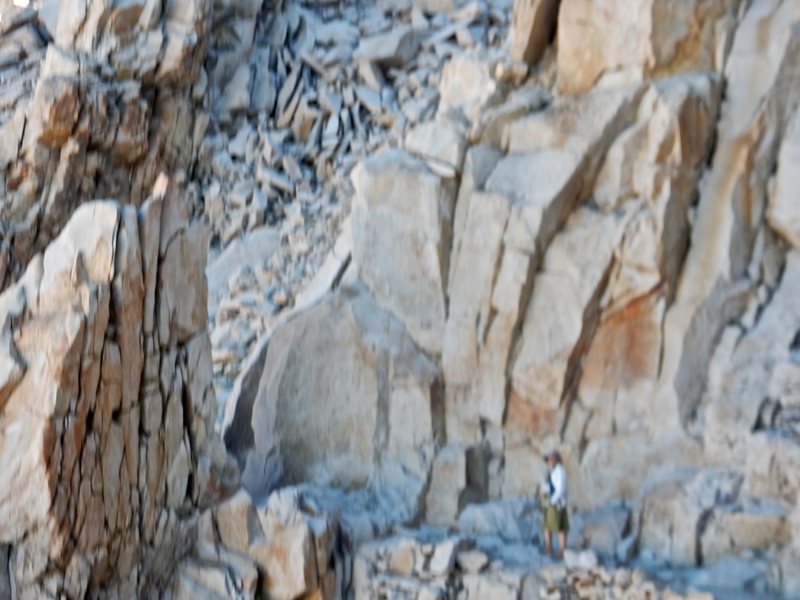 When we got to the summit, we found probably about 20 or 40 fellow-hikers spread out over the large gently-sloping carapace of broken granite slabs. 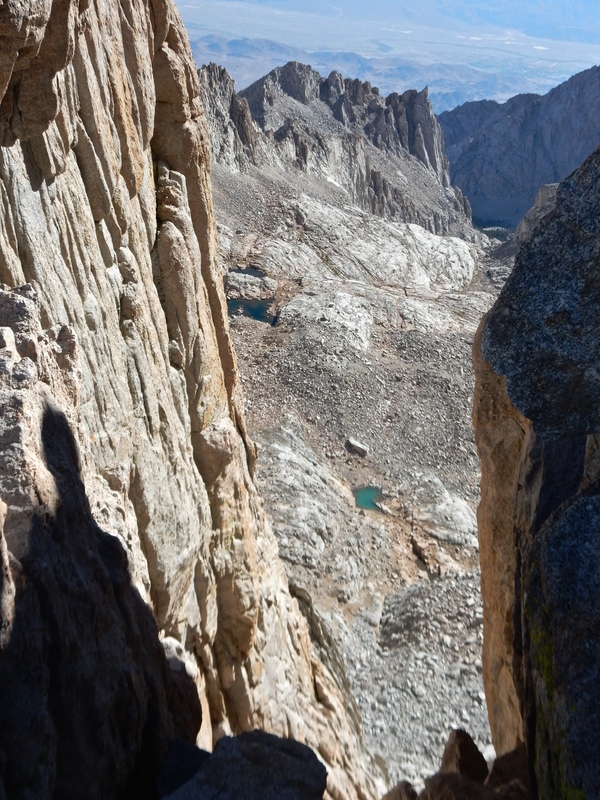 You could walk straight up to the edge, which fell away to the valley floor far, far below. The weather was perfect, warm and fresh with a gentle breeze. I called my mom from the top, but realized that while I was on the phone I had to close my eyes to prevent vertigo from overtaking me. Move away from the edge! 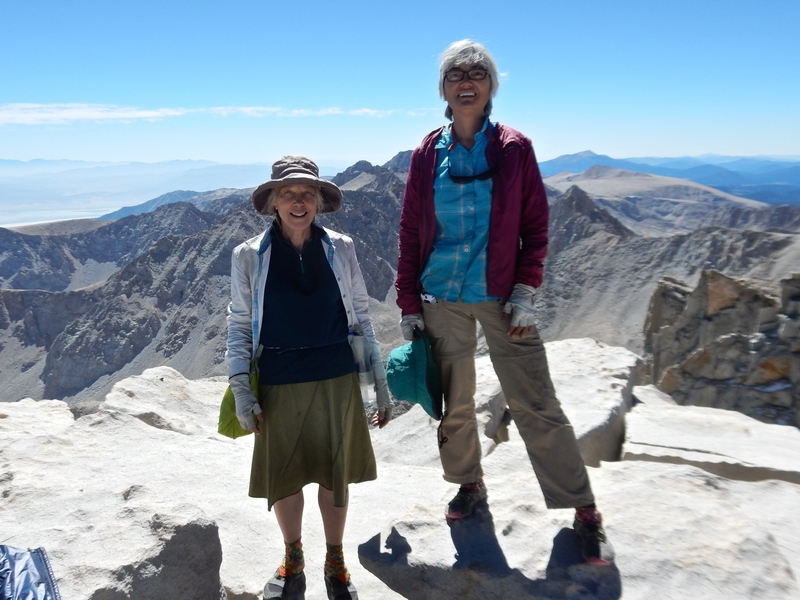 Betty and I signed the log book at the summit hut, and a man told us that this day, September 3, was the 50th anniversary of the passage of the Wilderness Act. It was signed into law by a nearly unanimous Congress. I think there was one lone dissenter (a Democrat defying the Democrat President L. B. Johnson). Can you imagine that??! I am full of gratitude for the trail builders, the preservationists, the visionaries, the politicians who made it possible for us to spend 22 days in such uninterrupted Beauty. Betty the Giant and her little sidekick. We spent perhaps an hour at the summit, and then started our long trek down off the top. 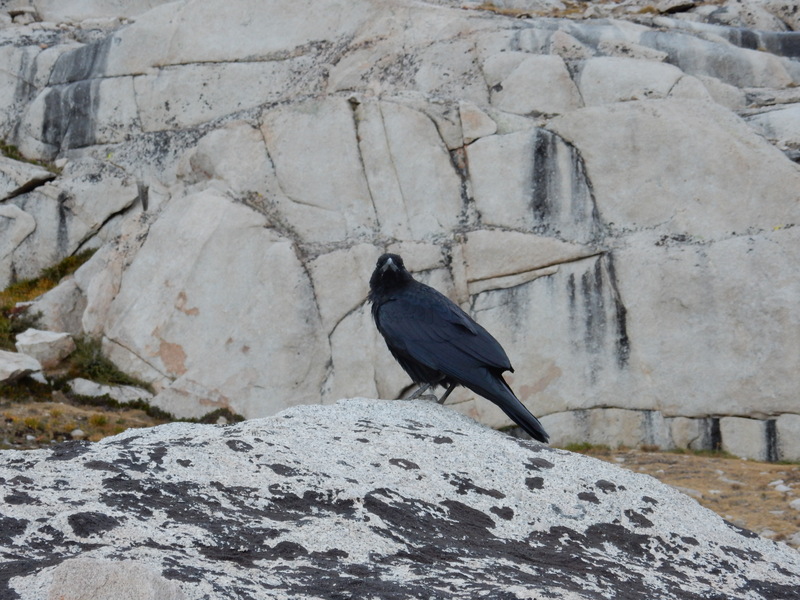 When we got back to the trail junction, we were happy to see Kenny there. 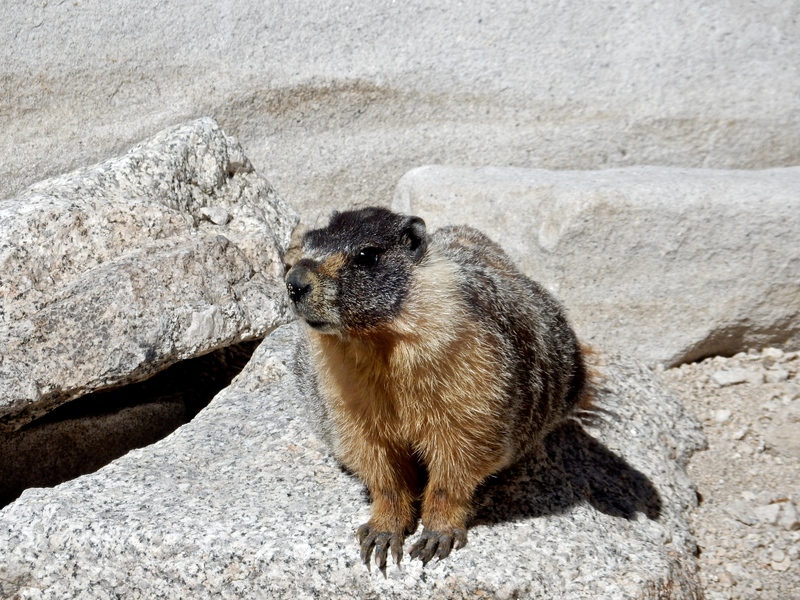 She was suffering from altitude sickness, and had decided not to go for the summit. We exchanged phone numbers and Betty invited her to come stay with us in Independence that night, if she made it down to Whitney Portal. Neither Betty nor I had any altitude problems, and while we were tired out, we felt like Super Women. Reunited with our packs, we started the long 8.7 miles downhill to the parking lot, where Dwight would be waiting for us (we hoped). 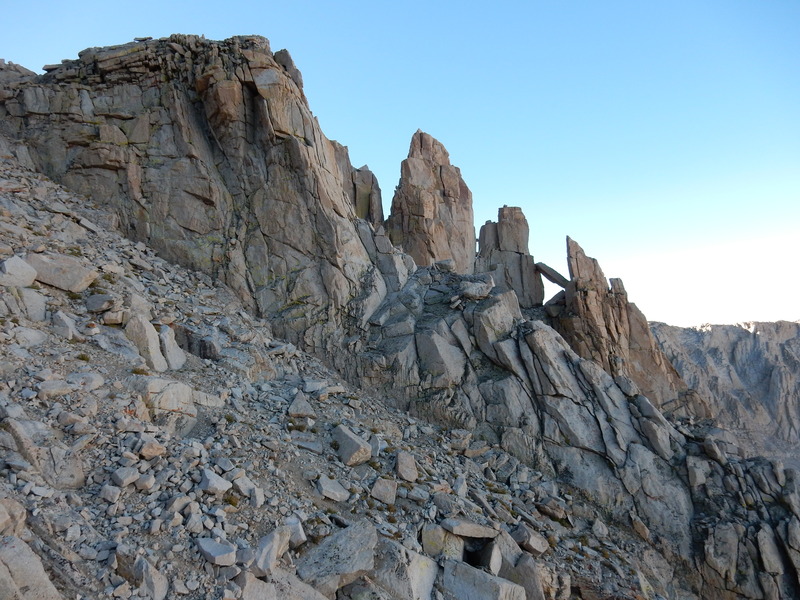 The trail was far more populous that we had experienced in previous days, as there are lots of hikers starting from Whitney Portal and just going to the summit. It was difficult not to feel a little smug, surrounded by all these weekenders and daytrippers. The hike down made me grateful that we had decided to start from the north end of the trail. 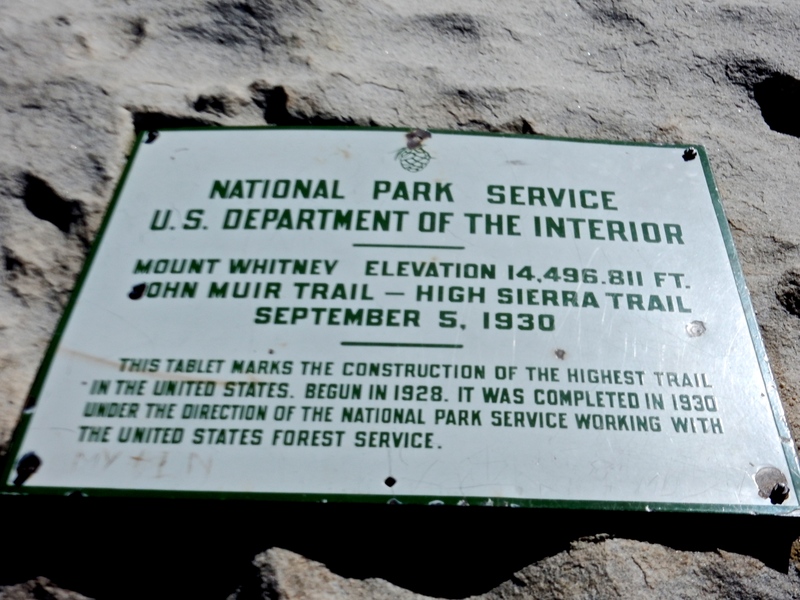 I would have hated for that climb up Whitney to be our first experience of the trail! Now that the hike was nearly finished, we were motivated to keep moving and get down the mountain. Even so, it was beautiful, and we walked through many places I would like to revisit. For a few miles, I kept a fantasy in my head of swimming in the lowest of the lakes that we would pass, imagining my cold-awakened skin and how refreshed I would feel. 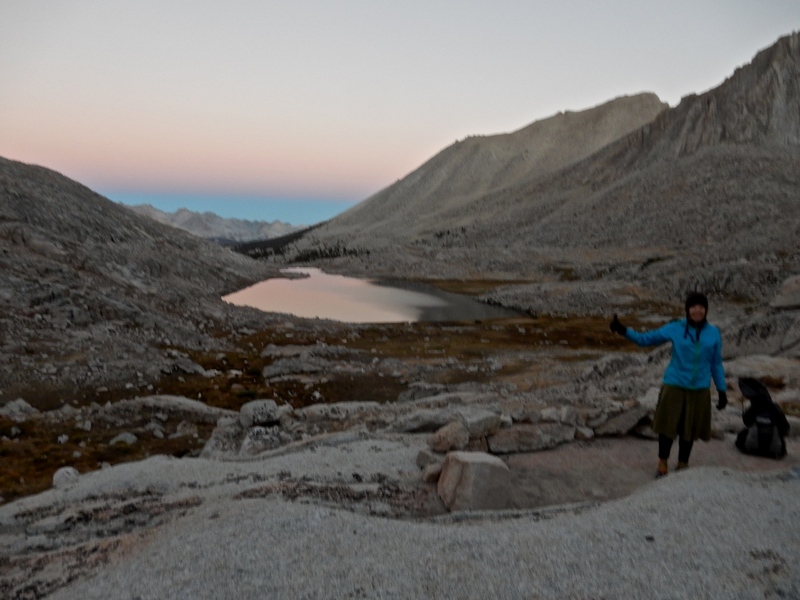 So Lone Pine Lake was my carrot. 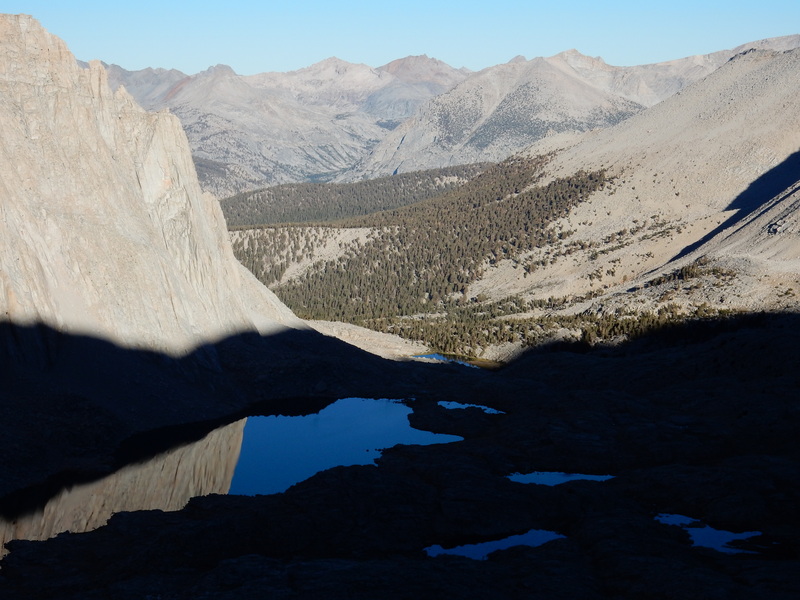 Turns out that Lone Pine Lake is off the main trail about a half-mile or so, and we opted not to spend the extra time or energy when we got to the turnoff. I had thought the path was going to wind right alongside it. A small disappointment. The trail down gave me one last time to visit the various biomes, from high above the tree line, into the stunted lodge poles and flattened willow bushes, through chinquapin and manzanita, into the tall trees, past profusions of wildflowers, and eventually to a paved road, the first that intersected with the JMT since Tuolumne Meadows 20 days earlier. The trek was marred for what seemed like hours, though, by an ear worm I couldn’t seem to exorcise. I kept hearing a loop of Homer and Jethro singing “There were nine buttons on her housecoat, but she could only fasten eight.” I finally had to put my mind to figuring why this wouldn’t go away, and then realized that a few days before we had met a guy on the trail whose nickname was “Jeffro.” We had seen him again up on the summit of Whitney. Ah-hah! 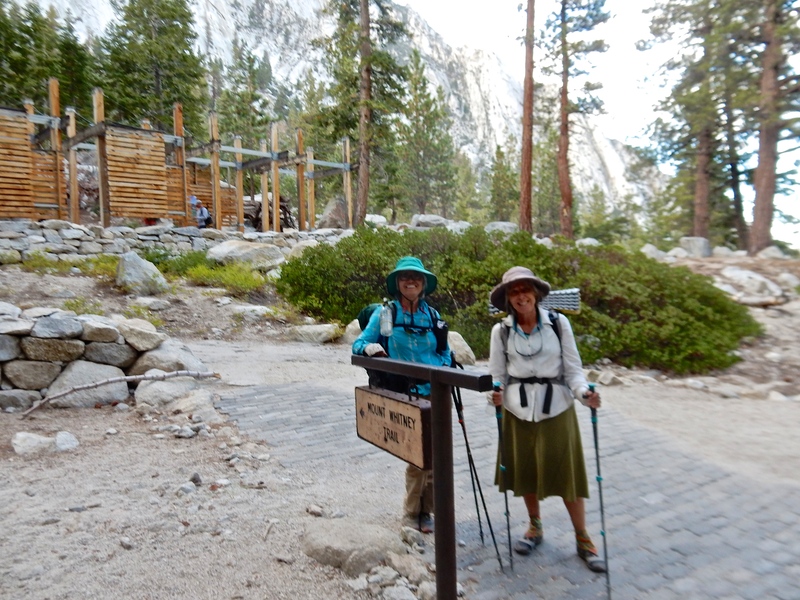 When we arrived at Whitney Portal, Dwight was there, along with Betty’s lovely dog, Molly. We dutifully bellied up to enormous plates of french fries (which weren’t nearly as satisfying as I imagined they would be. 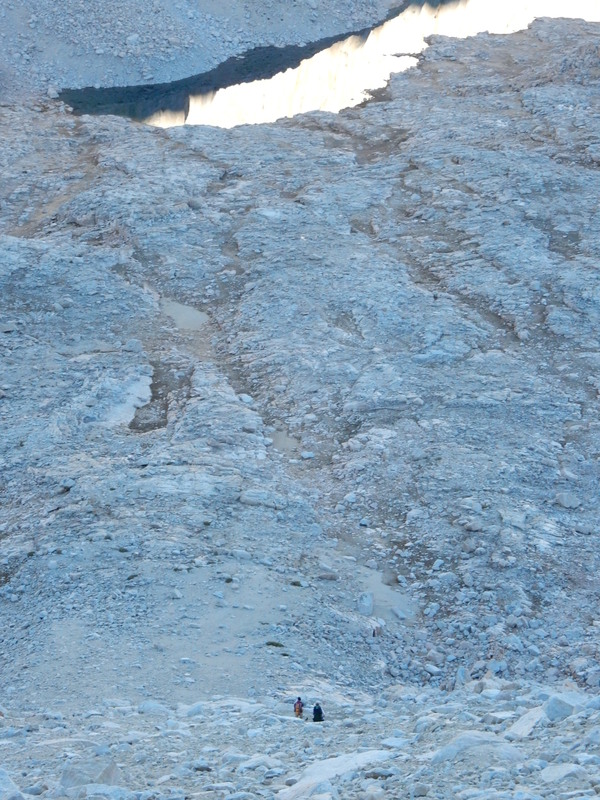 I couldn’t finish them all), loaded our packs and trekking poles into the car, and left the trail behind. 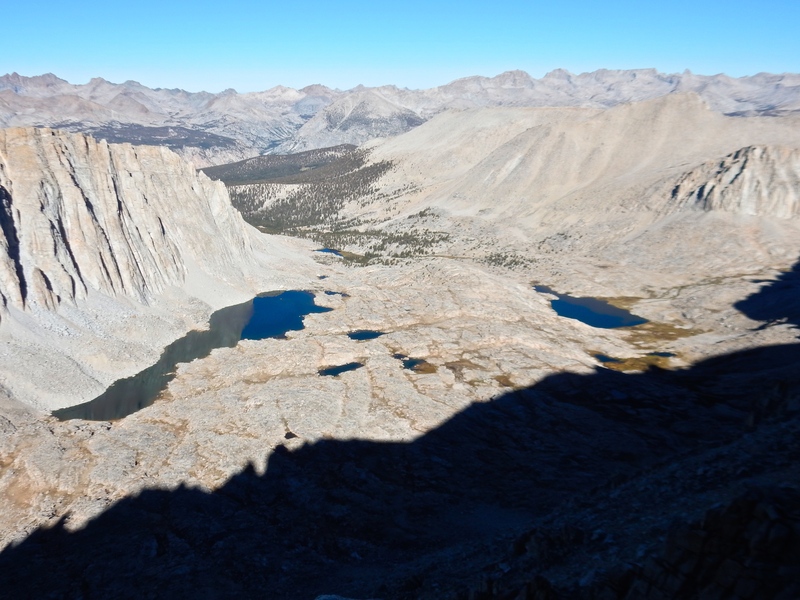 I would jump at the opportunity to revisit the JMT, and immediately started wondering whether I could take a month off next year and do it again. The high country has a deep hold on my heart. We pulled into our rental house in Independence, and met up with Tom. First order of business: a shower. Man, that felt good! Dwight had made a lovely spaghetti dinner, but I really couldn’t eat much. My stomach has shrunk and it needs so little to fill it. It was great to be reunited with my guitar, fiddle, and banjo! Tom and I are looking forward to two nights of rest before we played a concert in Sugar Pine, on the other side of the Sierra above Fresno. The next day, Tom and I stayed in Lone Pine and didn’t do much of anything except play our instruments and wander about town. The following morning, September 5, we drove up Hwy 395 to Hwy 120 and crossed over Tioga Pass in Yosemite National Park. It was so smoky there that we didn’t want to get out of the car. By the way, driving again was interesting: I actually wandered onto the shoulder on three separate occasions while gazing at the landscape around me. It took awhile to get used to the speed at which we were traveling. Luckily, I got us back on the road again with no problems, and within 30 or 40 miles I guess I was back in the here-and-now and once more trustworthy behind the wheel. 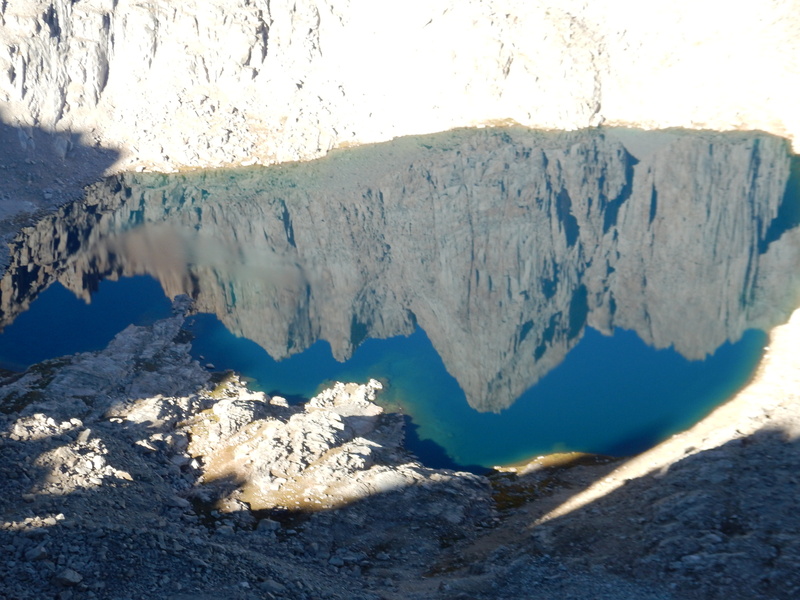 On Sept 6, the dense smoke that had hung over Wawona had magically dissipated, and the skies were brilliant blue. Just a slight change in the wind direction, and you’d never know there was a massive fire burning not so far away. So Tom and I stopped at the Mariposa Grove of Sequoias for a little rehearsal before our show. We pulled out the guitar, banjo, fiddle, mandolin and mandola and walked a short way up the hill from the very busy parking lot to play in privacy. It was lovely, sitting on a perfect log in the dappled shade and quiet, reveling in the joys of music. After awhile, we packed up and headed down to Sugar Pine, about 10 miles and 30 minutes away on winding mountain roads. It wasn’t until we were setting up for the show there that I discovered that my banjo was missing. I had left it just sitting on that log back up the road. I felt sure that it was gone by now, what with the area being so crowded. One of the people at the party worked at Mariposa Grove, and he called the ranger office there and asked someone to go look. There was a tense 20 minutes or so waiting for the return call, and when it came in, the person said there was no banjo to be seen. But our hero of the day, Steve, jumped in his car, taking a hastily-drawn map of exactly where the banjo log was located, and drove up to the park. An hour and a half later, he returned with banjo in hand! Turns out that our log was quite a bit farther off the beaten path than I had thought, and the banjo was undisturbed and undiscovered by any of the many tourists. Walking distances aren’t what they used to be for me. Every stroll is so much shorter than I what have become accustomed to. I am happy to say that I am now reunited with my Deering Goodtime frailing banjo. I am sad to be finished with my blog. As I think back on our trek, I see that it really was pretty uneventful. No bad weather, not a drop of rain, easy creek crossings, still plenty of water, relatively light packs, very little in the way of equipment or physical malfunctions, easy companionship, mostly good food. How can something so “uneventful” take such hold of me? Finishing writing about it means that it will recede into the past much more quickly, and I mourn that. 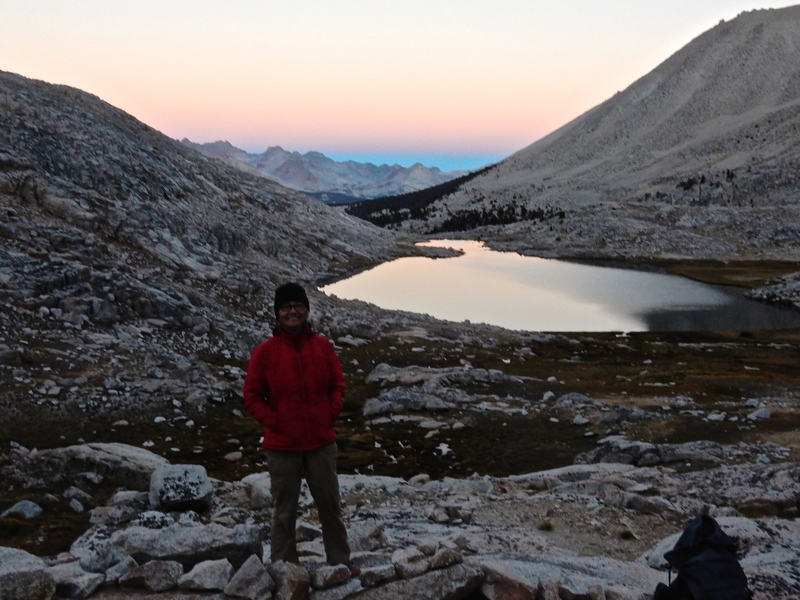 Next summer, I know I’ll be in the high Sierra again. I can hardly wait. I hope and pray, as we all do, that the drought will break its hold on the West, and we will have abundant snows and rains. The experts do not expect that to happen. If you are reading this far, I thank you for sticking with me on my journey, and urge you to get out there and make one of your own. See you down the trail somewhere. Really enjoyed your blog.Thank you for sharing..
A delight from first steps to trail end. Wonderful and wonder filled. Thank you so much for making the trek and memorializing it so engagingly for us. Laurie Thank you for sharing your glorious adventure with your readers. My heart pounds as I see photos and read your comments about places I have visited and places I have not yet visited. Thank you for adding all the how-to information, for food and gear. I tried my best to savor every screen of your blog before scrolling to the next. Bittersweet to join you – in story – for the hike out. Your friend Betty is a treasure! What a project to figure out food and food drops for 2 people. You are such a personable writer. The banjo – Oh no, it is lost. Oh great, it is found! I think it made a challenging trip harder to make photos and keep up your blog/journal. I think you did it as a gift to us, your readers. What a grand gift – thank you. Loved every word and thanks for sharing your glorious trip!! Amazing stamina! I loved the pictures too and especially all the trees!! THANKS!! !